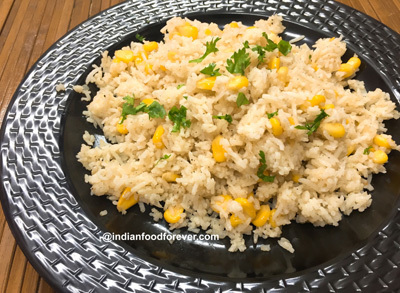 One of the easiest yummiest leftover rice or pulao sweet corn recipe ever. Gobbled by kids in a jiffy. Perfect lunch box or tiffin recipe. Paired best with mix veg raita or pickle or dal tadka or any type of curry. You guessed it right goes well with almost any thing. The addition of cheese makes it smooth and yummy. What is best about this leftover rice pulao is that tastes very good even when it is served cold. It is perfect for beginners in cooking or bachelors trying to cook up something in their kitchens with bare spices and masala. Lets begin and learn how to make sweet corn pulao. Wash the rice and soak for 30 min. In a heavy bottom heat the butter and then add the chopped onions. When the onions begin to get translucent add the frozen sweet corn kernels and salt. Let it cook for 3 - 4 mins stirring occasionally. When the corn kernels starts looking glazed with butter add the boiled rice and black pepper. With a gentle hand stir the rice and mix well. After 3 - 4 mins switch off the fire and sprinkle grated cheese. Mix well and cover for 5 - 10 mins or till the cheese gets pretty well absorbed by the rice. Before serving add chopped green coriander. You can serve it hot or cold as you please.